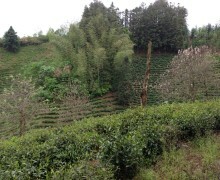 This tea is hand picked, and processed by hand as well. While black tea is often taken with milk and sugar, we recommend enjoying our teas pure. This organic black tea is hand plucked, and processed by hand as well. This certified organic tea is from the famous hometown of black tea in Anhui Province, and is a very popular everyday tea. Breakfast Qimen (Breakfast Keemun) is a blend of late spring and early summer tea. 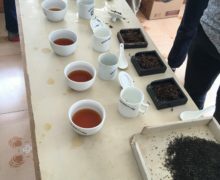 For those interested in a higher grade black tea plucked earlier in the spring, consider our Qimen Caixia (Sunrise Keemun). 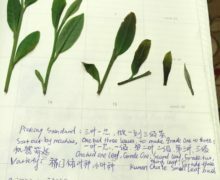 The leaves of our Breakfast Qimen are finely chopped to yield a bold brew. This strong-bodied tea infuses quickly, and is ideal if you like to drink your tea with milk and sugar. While black tea is often taken with milk, sugar or other flavorings, we recommend enjoying our teas pure. For an everyday grade of black tea, Breakfast Qimen is a very affordable option for people who like to start their day off with a strongly brewed cup of tea with less caffeine than a cup of coffee. This black tea’s flavor and aroma will persist for over four infusions. It also makes an excellent iced tea, which can be enjoyed by itself or with your favorite fruit flavors. Enjoy the intense red tea color and rich strong tannin taste with a lightly fruity aroma. As it is an easy tea to brew and drink, we recommend Breakfast Qimen if you are new to loose leaf black teas or enjoy English or other well known breakfast teas. Several grades of keemun brewed up for judging alongside their dry leaves on a judging table. Several large bags of different days' harvests of fresh Breakfast Qimen leaves waiting to be sorted. The Breakfast Qimen plucking standards for grades 1-3 in the 2015 harvest season.